The Alternative Minimum Tax (AMT) can apply to current and former employees of privately held companies when they exercise their incentive stock options (ISOs) if the fair market value is higher than the exercise price. The AMT can have a significant cash impact on those who exercise their ISOs. Holders of non-qualified stock options (NSOs) are subject to tax at exercise if the fair market value of the stock is higher than the exercise price (“spread“). If you leave a company and negotiate an extension on your exercise period that is longer than 90 days after your final day of employment, then your ISOs will become non-qualified stock options. NSOs are more typically associated with non-employees such as contractors and outside business partners. Moreover, employers are required to withhold at least 25% of the spread at the time of the exercise. This withholding includes federal, medicare, FICA, and applicable state income taxes. 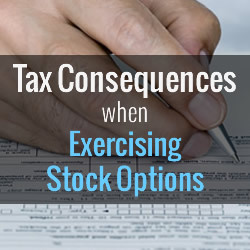 Since the cost of exercising stock options could already be very high, the addition of taxes makes the entire investment more burdensome as well as risky for many people. A solution for reducing this is risk is obtaining a non-recourse loan from the ESO Fund (www.esofund.com) to cover the entire cost of exercising your stock options, including the tax. An indirect benefit of letting ESO pay your AMT is having AMT credits for subsequent years when you are not subject to AMT. This is a very common result because many people only trigger AMT during the year in which they exercise a large block of stock options. Other benefits of an ESO loan include the proceeds being tax-deferred until the final liquidity event at which time they are easily covered by the profits from the event. Moreover, no periodic payments or principal or interest are due on ESO loans unless and until there is a liquidity event involving the company that issued the shares, such as a sale or IPO. At that time, the owner of the stock and ESO share the upside of the liquidity event and ESO is repaid. The sum of the above items equates to your AMT taxable income. Then calculate the AMT by multiplying by 26% the income amount up to $175,000 plus 28% of the amount over $175,000. So you now pay the IRS the greater of your regular tax or the AMT. If you end up paying AMT, then the difference between AMT and your regular tax becomes a potential tax credit for subsequent years when you are not subject to AMT.